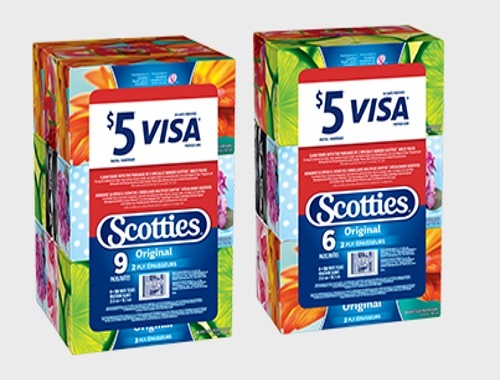 Get a Free $5 digital Visa prepaid card when you buy any 2 specifically marked Scotties multipacks! 1. Go to your favourite store and purchase 2 specially marked Scotties®’ Multi-packs. This offer is valid on purchases from July 15th to October 15th, 2017. Just a reminder: Both packs must be on the same receipt. 2. Take a clear photo of your entire receipt with your smartphone. Don’t forget the receipt must show the store name and date of purchase in the picture. 3. To upload your photo of your receipt, click “Upload” above. 4. After you submit your photo, you will receive a webpage with an automatic confirmation message and a request to complete a registration form. Registration can take up to 48 hours to process, so please be patient. Confirmations will be sent by email, be sure to check your inbox, spam or junk folders. If you do not see an email confirmation or offer code after 48 hours and you have checked your inbox, spam or junk folders, please email help@ScottiesRewards.ca. Registration form must be completed before an offer code can be emailed. Receipts must be submitted by October 20, 2017. Limit 1 reward per household.